The Speaker of the Parliament is going to appeal to the factions at the conciliation board. For today, the Ukrainian Parliament does not have a particular solution to overcoming the political crisis emerged after the factual break-up of the coalition, the Speaker of the Verkhovna Rada, Volodymyr Hroysman, stated in his video message on Facebook. "Unfortunately, as of today, there is no solution to overcoming this political crisis that had emerged. Though, I think that the positive thing is that the actual state of affairs in the country and the problems we are facing now are being discussed," he said. 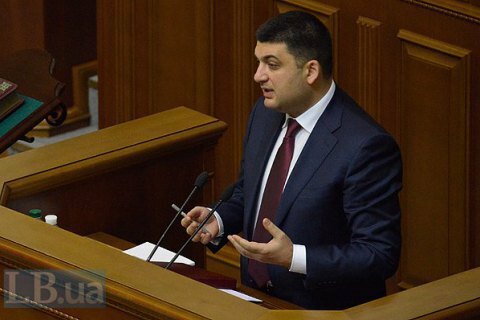 Hroysman also noted that at the conciliation board that day he would appeal to the factions to find such a way out. As reported before, Prime Minister Arseniy Yatsenyuk finds that there are three ways out of the political crisis for now. On 19 February, Hroysman officially announced the withdrawal of the "Self-Help" faction from the coalition. On 18 February, the Speaker read out the application from "Fatherland" as to the withdrawal from the Parliamentary majority. At the same time, it turned out that the withdrawal of the Radical Party from the coalition had not been officially announced. The coalition can exist until there are 226 signatures of MPs. The factions "Petro Poroshenko Bloc", "People’s Front" and "Radical Party of Oleh Lyashko" together comprise 238 MPs. Moreover, the signatures of the number of deputies excluded from the coalition factions, like Anna Hopko, are still under the coalition agreement. If a new majority is not formed within a month since the legal break-up of the coalition, the President receives the right to the dissolution of the Parliament. Although, he may fail to use this right. Petro Poroshenko has already stated that he will dissolve the Parliament only in extremis. On 19 February, before the Parliament left for the three-week break, First Vice-Speaker of the Parliament Andriy Parubiy had stated that there were 226 signatures under the coalition agreement.